Today, the U.S. government is again moving to embrace New Deal-like economic policies. While much has been written about the New Deal from a macro perspective, little has been written about how New Deal programs played out on the ground. In Back to the Land, author CJ Maloney tells the true story of Arthurdale, West Virginia, a town created as a "pet project" of the Roosevelts. Designed to be (in the words of Eleanor Roosevelt) "a human experiment station", she was to create a "New American" citizen who would embrace a collectivist form of life. 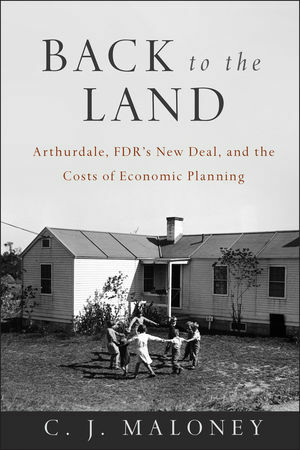 This book tells the story of what happened to the people resettled in Arthurdale and how the policies implemented there shaped America as we know it. Arthurdale was the foundation upon which modern America was built. Back to the Land is a valuable addition to economic and historical literature. CJ Maloney (New York,?NY) is a vice president and portfolio manager at a Wall Street investment firm, and often provides background analysis and comments for leading finance writers. He writes regularly on economics, history, and politics for Mises.org, LewRockwell.com, Anti-War.com, Liberty magazine, New York Young Republican magazine, Crit Hit, and others (sometimes under the nom de plume Cyd Malone), and speaks before libertarian groups such as the NYC Campaign for Liberty, the Manhattan Libertarian Party, and Ivy League Alliance/Students for Liberty at Columbia University. He graduated from SUNY Old Wesbury with a degree in finance and NYU Stern School with a MBA in finance/accounting. Prior to his position with Neuberger Berman, he was with Lehman Brothers from 2000 until the firm's collapse where he managed $500 million in taxable and tax-free accounts after running the MAP trade desk. Previously, Maloney worked on the NASDAQ trade floor at Prudential Securities from 1998 to 2000. He served four years in the United States Air Force from 1987 to 1991.